"It's disgusting and it's unacceptable," LA Mayor Eric Garcetti told NBC4. For months rat-infested trash has been piling up on Ceres Avenue, a street that connects downtown LA's bustling produce and garment districts. Now, health officials say accumulations of trash like this could be a cause of an outbreak of the bacterial disease typhus. LA's mayor is now in apology mode. "It's disgusting and it's unacceptable," LA Mayor Eric Garcetti told NBC4, after the I-Team showed him pictures of garbage piling up for months. "Well, it should have been. And we're going to get to the bottom of why it wasn't and make sure that it is." The LA County Public Health Department says "typhus is a disease that infected fleas can spread to humans." The fleas often live on rodents, cats, and dogs that are drawn to garbage. There are 57 cases of typhus reported in LA County so far this year, far higher than most years. A cluster of nine cases has been identified in what officials now call "The Typhus Zone," a section of downtown LA encompassing Skid Row and newer upscale residential housing and businesses. "I actually kind of wanted to die, because I couldn't figure out what I had," said Van Shemirani, who owns a clothing company in the Fashion District. He told NBC4 he suffered two months of high fever and nausea before his doctors at UCLA Medical Center diagnosed him with typhus. Shemirani says his warehouse was constantly overrun by rats, which he suspects were the cause of his typhus infection. "I definitely think I got it from the rats," Shemirani said. People who work in the downtown and Skid Row areas say they've complained constantly to the city's 311 number to pick up piles of trash but the calls often go unaswered. Records obtained by the I-Team show the Department of Sanitation received more than 2,200 calls to 311 over a two-year period to pick up trash near homeless encampments but failed to respond to more than half of those calls. "If someone is calling 311 and not getting through that's unacceptable," Mayor Garcetti told NBC4. "Things sometime slip through the cracks but this is unacceptable and I'm going to make sure that it doesn't happen, Garcetti added. 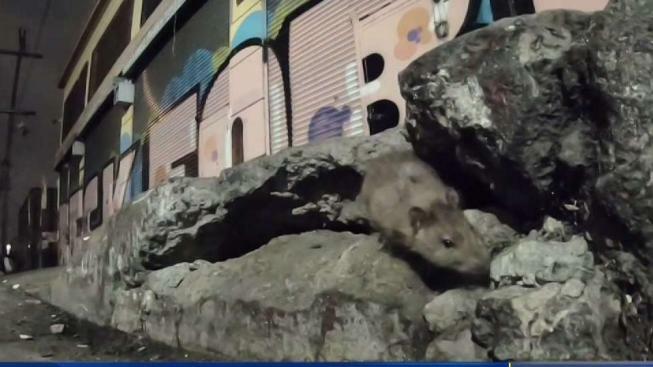 After Garcetti spoke to NBC4 about the typhus outbreak and the city's failure to control trash and rats, the Mayor's Office called the I-Team. His spokesman Alex Comisar said the city is now allocating an extra $300,000 to cleaning up trash and sanitizing streets around the "Typhus Zone." The clean-up, according to Comisar, has already begun. There is a typhus epidemic in LA County right now with a recent outbreak of cases around downtown LA. 1. Typhus is not typhoid. Typhus is a disease spread to humans by fleas from dogs, cats and rats. Typhoid is a food-borne illness transmitted through contaminated food and water. 2. A typhus outbreak in LA includes people living on the streets and also workers and business people. 3. Typhus symptoms include high fever, rash, abdominal and muscle pain. 4. Typhus is rarely fatal and can be treated with antibiotics. 5. You can prevent getting typhus by using flea products on your pets and keeping away from wild animals like feral cats and rodents.